safety valve(s) and pilot first to get started. If oven does NOT TURN ON or operate, problem can be in several areas ... most economical solutions below - no cutting or fitting - Fits Right! * Click here to see some of the many styles we offer rebuilding on for your stove. > TS7, TS11, MR2, MR3, Grayson 1930s, Bryant Igniter, Harper Wyman, Robertshaw DT, and Chambers built-in CharGlo. or trying to find a generic replacement part! "The CHECKER" will let you know if your thermocouple or safety valve is not operating properly. Also used for thermostat thermocouples. Just unscrew threaded end (A) of thermocouple from the safety valve and into the checker (B). Hold in for 1 minute. If end pops out the thermocouple is bad. Requires no electricity or batteries - no meters to read or technical knowledge necessary. Can also be used to test thermocouples outside of stove with just a lighter. Good for the life of your stove. ...refurbished for half the cost. My plumber re-installed the thermocouple and refurbished safety valve..."
Last February I bought a house that was built in 1950. It's a lovely house with red oak hard wood floors, lots of windows and a wonderful Universal gas stove in excellent condition, except the oven didn't work. A local plumber diagnosed the safety valve problem. J.E.S. responded quickly by email and I arranged for my plumber to disconnect the thermocouple and safety valve so the parts could be mailed to JES. Now all is working again! 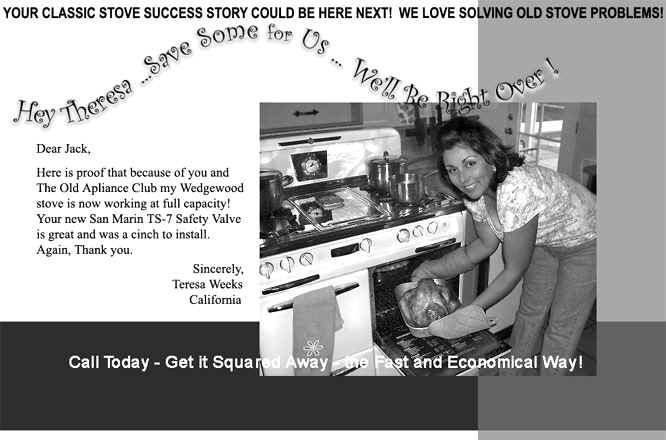 Thank you soooo much for fixing my oven. Since I got it in May of this year I have never been able to use it. I'm a baker!!! I'm so Happy! :) Thank you and your team. all units in stock for core exchanges. 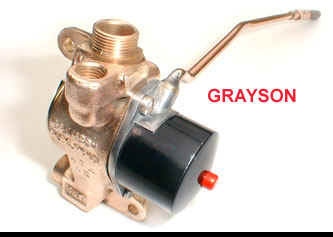 Commonly known as the "Pickle Valve" for its shape, the Grayson TS-7 can now be remanufactured to better than original factory specifications. We own the only magnetic head servicing machine in the U.S.A. This machine was developed by Jack Santoro CEO of J.E.S. Enterprises, Inc. His studies for over 50 years in the magnetic field sciences inspired him to seek a way to restore vintage magnetic valves to full performance.This service is unavailable anywhere else and is included at no extra cost. 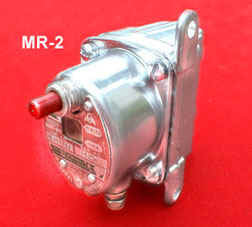 All Safety Valves carry a TWO-YEAR domestic warranty. Units are heat and cold cycle tested for maximum performance. Magnetic heads are serviced and re-magnetized. Each unit is leak-proofed, casings are chem-bathed, shop tested and factory certified. All TS-7 and San Marin Valves are fitted at no extra charge with custom made Santoro Safety Seals . These are the finest seals made in the world. Email pictures, front back and side, of the valve. Once all is working, send in your old core for exchange. Let us know the problem you are experiencing. Send digital pictures first of the safety valve and pilot so we can see if we can help you asap. 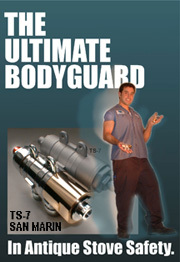 After the parts examination we will contact you for the quickest and most economical remedy. *Broken or dismantled safety valves excluded. Expert rebuild services save your time and money. Just follow your thermocouple sensor tube to your safety valve. Email pictures, front back and side, of your valve. We will reply if we have an exact match on the shelf ready to ship. Typically, the pilot lite is on but the oven won't stay on at all or will only hold for a while, even after you pushed and held the safety button in. Hire a licensed appliance tech to diagnose that your safety is actually the problem first. *All safety valve work is a custom order. combination pilot that is a custom order. All major cards or PayPal accepted. 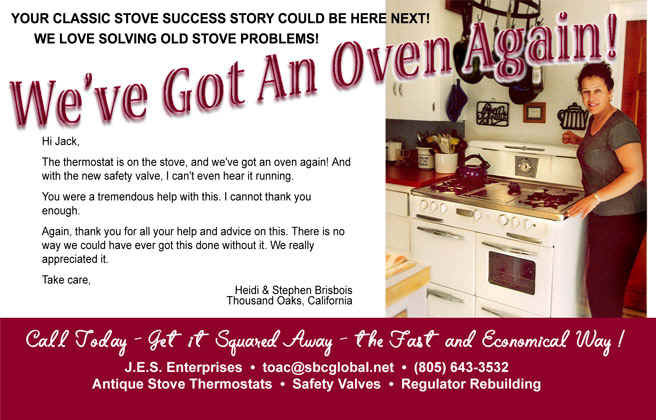 The very best and least expensive way to correct a safety valve problem is to have what is already in the stove rebuilt or replaced with an exact rebuilt original. to replace the high quality safety valve. After all, for 40, 50 or 60 years! of service these quality valves could use a rebuild. They were USA Made to Keep Going Strong! Email a picture of your safety valve to toac@sbcglobal.net or send in your old safety valve for a FREE Bench test. We report back within 24 hours with test results by Email (except on holidays and weekends). Remember, the test is free on non broken or dismantled valves ! All you cover is return shipping. *Remember to send digital pictures first! 24", 30", 36", 48", 60" or 72"
Heavy duty, extra sensitivity, longer lasting, fully tested. Free Instructions for your stove. 1. No extra retrofitting expenses and time. 2. Easy Fit! Rebuilt valves go back in the same way they came out. Same size. 3. Replacement valves restrict use of storage rack due to larger size. 4. Quality! USA made original valves were Made to Last. Rebuilds are Warrantied! 5. Economical! You $ave by rebuilding the original. Outstanding Service. I asked a million questions and got answers to all of them in a very prompt manner. I have an antique stove that has been in the family for over 60 years and they helped me keep it working by providing a hard to find replacement thermostat. Not only that, but detailed easy to follow instructions on how install it. I live in an area where finding repair people to work on one of these impossible, but with their help I was able to tackle this job and keep a great piece working. I can't say enough good things about them. My Oven is Working Beautifully. J.E.S. did some diagnostics on the safety valve and told me it could be refurbished for half the cost of a new safety valve. My plumber reinstalled the thermocouple and refurbished safety valve. For the first time since I bought the house, my oven is working beautifully. And just in time for the Holidays! The rebuilt safety valve and pilot assembly arrived yesterday for my Western Holly stove and I was able to install them last night. The oven works again!!! Thank you !!! I will be ordering some cables for the oven door and replace the safety and the pilot on the broiler side too. I will Certainly be in Contact With You. and it works perfectly. If I need anything else for my stove I will certainly be in contact with you. 1952 O'Keefe & Merritt - Working - Totally! I'm happy to report that our 1952 O'Keefe and Merritt stove is finally working - totally! I installed the parts you shipped, did a bubble test and all seems well. Just wanted to give you guys a big American-Flag salute for helping me get our stove up and running. My wife is so happy! Our stove is like a new toy and it's our Christmas gift, too! My wife can't believe she got her X-Mas present. Finally! I would like to thank you for your help in locating a replacement safety valve for my gas on gas stove. I installed it a couple of weeks ago and it works great. The pilot takes 30 sec. or less to light, and when you blow out the pilot after running, the unit will not run with the pilot out as it is suppose to. THANKS AGAIN! The safety valve rebuild worked great!